WELCOME TO THE AUSTRALIAN SUPER COTTON WEBSITE. The place where you will find - the longest, finest, softest, strongest threads of upland cotton in the world, grown under Best Management Practices. Rogan Pastoral Co has been growing upland cotton at St George since 1973, one of Australia’s most highly regarded cotton producing areas. For the past 7 years, we have been a dedicated grower of Australian Long Staple (ALS) premium cotton varieties. We have been a key grower in the Australian cotton industry's "Premium Cotton Initiative" which started in 2007. Have you ever wanted plush, durable, soft fabric that dries quickly?. Australian Super Cotton is the answer. It’s standout feature - long staple (fibre) length - means you can create a stronger garment or textile product out of less yarn. Fewer fibres in turn mean softness and a more luxurious feel. The raw premium cotton feels very soft and silky, with a bit of a shine about it, similar to wool. Australian Super Cotton is premium cotton - so premium that it’s in a class of its own. Producing premium cotton its much more than selecting the right varieties. Much of the characteristics are to do with the hot dry area of Australia it’s grown, but more importantly the management decisions made during the life cycle of the crop. AUSTRALIAN COTTON CONFERENCE AUGUST 14-16, Australian Super Cotton grower Glenn Rogan available to speak direct with buyers and manufacturers at this years’s Cotton Conference. Conference exhibitor number 300 adjacent to Elders Delegate lounge. SALE 2012 AUSTRALIAN SUPER COTTON Catalogue of Australian Longstaple Cotton can be seen in the sales section of this website. This ALS cotton will be sold by Tender. Facilitated by Stuart Thompson First Class Pty Ltd. Bids will close by 4 pm on 16th August. back garden! Have a look at the new August edition. A strong silhouette, an array of textures and a crisp, fresh feel imbue the sweet innocence of white with an enviably modern aesthetic. Photographed by Corrie Bond. Styled by Kate Harrowsmith. Hair by Brad Mullins. Models; Victoria/Vivien’s; Vivian/Chadwick. Special thanks to the “Benelong” cotton farm, St George, Queensland. "Longest, finest, strongest threads of upland cotton in the world - grown under Best Management Practices." "It would be like comparing expensive women's underwear to a hessian bag - that's the difference in the feel of the raw cotton,"
Varieties used and management practices used are at the scientific leading edge for water use efficiency. The best of Australian Long Staple upland cotton will be a class above “Egyptian” blended cotton in length, strength and fibre characteristics. The difference is this: the end fibre result isn’t the only consideration when choosing yarn for your next project. The way we farm is an opportunity to conserve Earth’s natural resources. Australian cotton varieties beat Egyptian varieties for water efficiency, yield and other parameters particularly using the Best Management Practices scheme. Cotton rose to commercial manufacture in Australia in the 1960’s and was initially of average quality and yield. Early in 2000, the Australian cotton industry raised the bar for fibre length, strength and micronaire. At that stage, Australia’s lowest length was already longer than the accepted World standard. 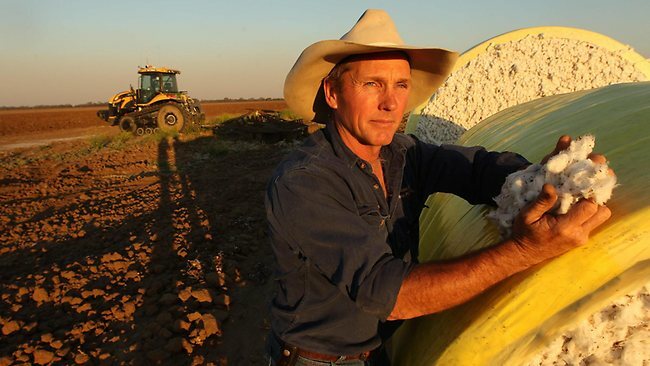 We want to see Australia be the new world leader of premium cotton. In 2004 the cotton industry was developing a variety that would meet those needs. Glenn Rogan, of ‘Benelong’ St George, has grown Sicala 60BRF, Sicala 350B and Sicala 340BRF. He wass one of the first six producers in the country to grow and trial Sicala 350B as part of the industry Premium Cotton Initiative. St George in South West Queensland is the ideal place to grow specialty cotton. With water allocations most years from the Balonne River, at the intersection of two major transport routes, and access to two ginning plants within less than 50km’s, ‘Benelong’ is situated in a winning spot. Glenn voluntarily uses Best Management Practices whilst growing his cotton. One very appealing feature of this leading industry initiative is that it enables full traceability - from end product right back to which paddock the cotton was grown in by individual farmers. It also ensures that cotton is produced on farm with the best farming techniques, technology and in an environmentally sustainable way. Part of that environmental sustainability process involves water management, with Sicala 340BRF performing well in dryland situations. Premium cotton comes with its own hidden costs though; unfortunately to have longer fibre length and fibre fineness often means lower yields. “We grow this variety for a specific market and reason, however the yield drag is noticeable. The first year we planted Sicala 350B we noticed a 15% drag, ” says Glenn. Graeme Rogan, Glenn’s father, first grew cotton at ‘Benelong’ in 1976. A strong desire not only to be part of an industry, but also to give back to it, lead to participation in trialling various varieties of cotton over more than 25 years. Dri.glo, a brand produced by Australian Weaving Mills (AWM) first produced 100% Australian made, owned and grown towels and bed linen in 2011 and is sold through quality retail outlets as Myer, David Jones, Harris Scarfe and Pillow Talk. Glenn’s premium cotton found its way to AWM because he participated in the Best Management Practices scheme, which promotes sustainable, traceable farming. So the idea of producing premium quality towels under the DriGlo label and linking them back to the farm they originated from was born. with between 400 and 1000 hectares under cultivation most years." - Glenn Rogan "Outback Magazine"
"Benelong has been a carefully balanced development of irrigation and grazing on prime agriculture land." The aggregation “Benelong”, “Willandra” and Harlequin” comprises of three adjoining properties with the central property “Benelong” located 22km south-east of St George. The property is a combined area of 2,760ha. The initial farm "Benelong" (240ha irrigation) was acquired in 1973 through a ballot process which promoted the irrigation development in western QLD. The property was fully timbered without buildings or cultivation. "Benelong" grew its first cotton crop in 1976. "Harlequin" was purchased in 1977, also fully timbered without improvements. Today it has 750ha of irrigated cotton, 850megalitre dam, 3 homesteads, paddocks for 30 horses and 1500ha cattle grazing country. Another grazing property "Cressent Vale" west of St George was owned between 1983 and 1995 for wool and cattle. "Bookamerrie" located in the centre of the St George Irrigation Area was purchased in 1989 and is now owned and operated by Cleave and Johnelle Rogan. "Willandra" 185ha irrigated cotton joined the aggregation in 1995. The farms major water storage 1250ML was completed in 2000. Glenn Rogan is an ordinary man growing extraordinary cotton. Working on the farm from cultivation, bed renovation, planting, fertilizing, harvest and then back to cultivation - there’s always something to be done. Family partriarch Graeme and his wife Robyn moved their young family (aged 4-9 at the time) to ‘Benelong’ in 1973, droving sheep and cattle up for 3 months on horseback. (see Glenn’s story in Outback magazine) The move into cotton came with the development of the St George Irrigation project. Graeme included the children in the family business very early on. Glenn had only just left school when he was included into the partnership. That partnership continues today, with Glenn taking over the bulk of the management of the farm. Glenn's brother Cleave runs his own family’s cotton farm, brother Wayne his own earthmoving business, sister Gayle has recently moved back to St George. And youngest sister Denise is an accomplished dressage rider in Sydney. To craft the farm from acres of scrub to the thriving cotton farm it is today, Glenn studied Applied Science. "In going to university my desire was primarily to give me the background of science and the knowledge we needed to be better farmers.” Glenn's daughter Rebecca, 26 years followed in Glenn's footsteps also studying Agricultural Science. She has recently started working with the family business as the product development manager. Glenn's wife Julieanne is a Brisbane girl who came to St George in 1999 to work as a Speech Pathologist at the local hospital. They have two children Edward, 9yrs and Annabelle, 8. Along with cotton and his family Glenn's other passion is horses. He is an avid polocrosse rider and a strong St George Polocrosse Club Committee member. St George is a large primary producing district including cotton, grain, beef cattle and table grapes. Jack Taylor weir and Andrew Nixon bridge (which forms part of the Balonne Hwy) commenced construction in 1948. It provides water for the town and farms in the first section of the St George Irrigation area via a series of gravity fed channels. Beardmore Dam 16km north of town was completed in 1972 to further promote the planting of irrigated crops. In 1851 the Brisbane Courier described the Maranoa District as 'almost unoccupied'. Today St George boasts education and health services; childcare, kindergarten, 2 primary schools, high school and a skills center. Two medical centres, hospital, allied health services, visiting medical specialists, home and community care and a retirement village. Local weather - mostly it's sunny. You can expect hot summer days (34.2 + degrees) and cold winter nights (5.5 - degrees). In this region, rainfall is highly variable, our annual average is 516mm. The weather pattern is one of droughts and flooding rains. Rain is more likely in the summer months. A range of lifestyle and sporting activities are available. Team sports - football of various codes, cricket, bowls, dragon-boating and netball. Individual sports - tennis, squash and golf. Horse sports - races, pony club, campdrafting and polocrosse are available. We would like to thank MARIE CLAIRE, DANA GLUZDE and many more for their support & talent in creating these images. There is currently no "Australian Super Cotton available for purchase at this time. Please contact Glenn on 07 4625 2156 to discuss options for 2014/15 crop. We will be having products available soon. The DRI. GLO towels will be available online, posted direct from point of manufacturer (Australian Weaving Mills). Hereford and Brangus cattle available for sale each year. Dry ideas: partnership with an Australian towel manufacturer has allowed the Rogan family to become premium cotton producers on their souther Queensland farm (Apr/May 2012). Photoshoot at 'Benelong' Farm May 2012. Appearing in the Marie Claire August 2012 Edition. Marie Claire Australia: Victoria Anderson & Vivian Witjes in "Blanc Canvas" by photographer Corrie Bond. Glenn and Julieanne Rogan were presented with this prestigious award. For more information please have a scroll through our Australian Super Cotton Website. Farm Hands Plant Operators for upcoming pick season.